BERWICK CASTLE was built in 1902 by Wm. Beardmore & Co. at Glasgow with a tonnage of 5883grt, a length of 398ft 2in, a beam of 50ft and a service speed of 14 knots. Sister to the Alnwick Castle the Berwick Castle was one of a quartet of emigrant and cargo liners ordered by Union-Castle Line shortly after the amalgamation of 1900. (The other two were Cawdor and Newark Castles). On 18 March 1904 while proceeding from Southampton to Hamburg, Berwick Castle was unfortunate to collide with and sink HM Submarine A1 during naval manoeuvres in the Solent. The mishap occurred off the Nab Lightship and all of the submarine’s crew were drowned. 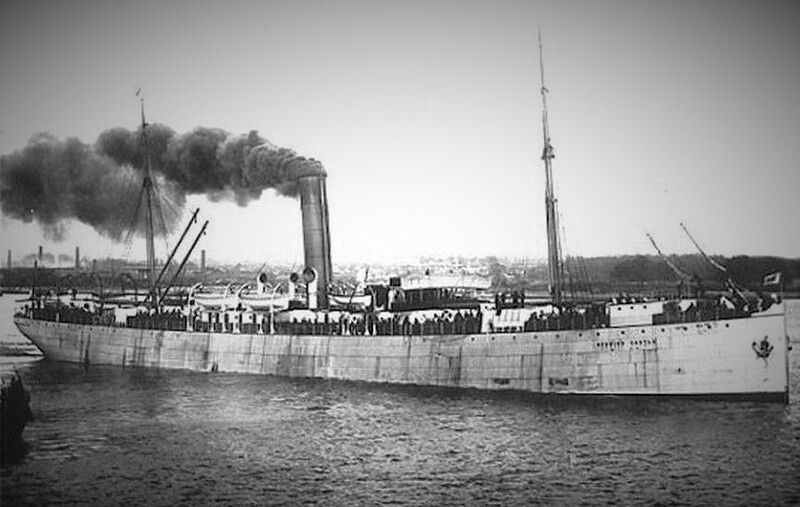 Until the outbreak of the War in 1914 Berwick Castle was employed as an “extra” steamer and with her sisters maintained a regular service to Mauritius. Of her war-time voyages the most notable was probably that of November 1916 when she conveyed a portion of the Nigerian Brigade from Lagos to Mombasa where the troops were disembarked for service in German East Africa. (On this occasion she had as a consort the ill-fated Mendi which was soon to go down in the English Channel with 700 South African natives. After the Armistice she made voyages with returning South African troops, notably Air Force cadets and was then sent up the east coast. When off Port Reitz in October 1919 she caught fire and was practically gutted. 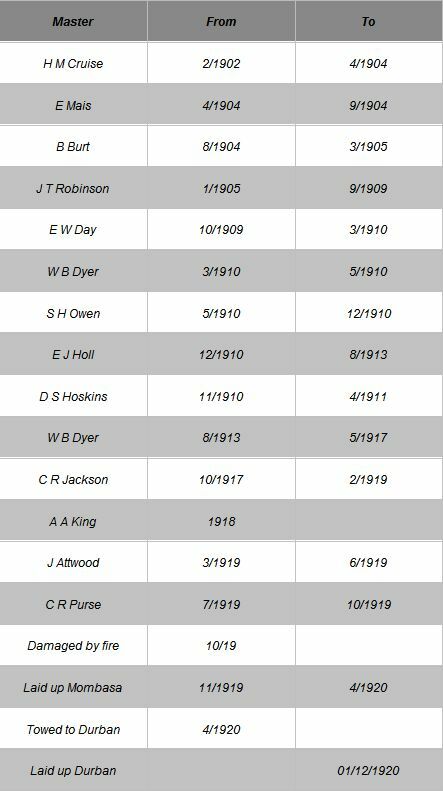 For a year she lay at Mombasa but in April 1920 she was able to steam/towed down to Durban where she was put up for auction in the following October. At first she was withdrawn unsold but subsequently was purchased by Andora Soc Anon of Genoa, who intended to run her as an Italian emigrant vessel to America. The scheme never materialised and the Berwick Castle, now renamed Andorra Castle, reached Mauritius from Durban in June 1921 and lay there for many months. Finally in March 1925 she arrived at Spezzia and was broken up. Original and unique postcard from the archive of Oscar Parkes . 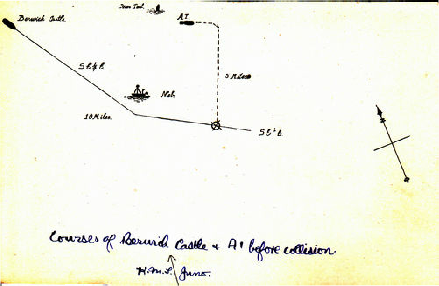 Postcard is a diagram of the courses taken by the Royal Navy submarine A1 and the Union Castle Line vessel Berwick Castle on 18 March 1904. A1 was undertaking a practice attack on HMS Juno . The collision occurred in the Solent . Directions of all three vessels are shown with collision point and all three vessels are named. Oscar parkes was editor of Janes Fighting Ships until 1935 he was also director of the Imperial War Museum photographic archive . The A-1 was a very unlucky ship. It was sunk twice, the first time taking its entire crew to the bottom with it in 1904. The sub went down in shallow water, however, was recovered, rebuilt and put back in service, only to be sunk a second time in 1911. The second time the vessel was unmanned so there were no casualties. The first disaster occurred on Friday, March 18, 1904 while participating in a mock Naval battle off the Isle of Wight. During the exercise, A-1 was tasked with "attacking" HMS Juno, a navy cruiser. As the submarine moved into position for its fake torpedo shot, it was struck by the passing steamship Berwick Castle on the starboard side near the conning tower. The A-1 was fatally damaged in the crash and sank in 37 feet of water taking all 11 hands to the bottom with it. The Berwick Castle was steaming from Southampton to Hamburg, Germany, that day and its pilot had not been informed of a submarine operating in the area. During an inquiry that followed, the ship's master said he believed that he had been struck by a practice torpedo and continued on his journey. The disaster went unnoticed until A-1 failed to return to the harbour that evening. An investigation revealed the full scale of the disaster that had occurred under the waters, but right before the eyes of Naval officials. Thus the A-1 is remembered as the first naval casualty involving a submarine at sea. One result of the disaster is that all Royal Navy submarines built after that were equipped with a watertight hatch at the bottom of the conning tower, to give the crew a chance to escape in the event of a similar incident. The submarine was raised, rebuilt and utilized by the British Navy until August, 1910, when A-1 was severely damaged in a fuel explosion. It was repaired once more but never used as an active submarine. Instead it was use as a test-bed for the Admiralty's Anti-Submarine Committee. It was lost in 1911 when running submerged but unmanned under automatic pilot.